Time Out parties with Royal Court Theatre (Time Out London, 6 mai 2011). Last night, Oakley Capital in association with Time Out sponsored one of the best parties of 2011: the Royal Court Gala, held at Shoreditch Town Hall, went off with a bang and helped to raise crucial funds for the theatre. The post-dinner auction – which was introduced with a genius promo film starring the likes of Romola Garai and James Fleet – was followed by a short play by Richard Bean starring RC alumni including Rachel Stirling, Benedict Cumberbatch and Matthew Macfadyen. [...] Check back here for exclusive party pics on Monday. I am ALL EXCITEMENTe for this evening's Royal Court Gala in which the Town Hall of SHOREDITCH is to be Transform'd & Fill'd with THESPIANS. A Gala like no other that has gone before (Mask Event Design & Production, mai 2011). And no sooner was coffee served than the guests were shocked with another performance, as Royal Court celebrity alumni surprised guests right next to them by jumping up onto their tables and performing A Brief History of The Royal Court Theatre, written by Richard Bean. Matthew McFayden, Lesley Sharpe, Benedict Cumberbatch, Doug Hodge, Toby Jones and others all swapped stage for dinner tables before these were whipped away in a scene change and transformed into a custom built Belvedere Vodka Bar and dance floor. The scene change culminated in the revealing of a further bar on stage, at which were set sixty VIP guests in a perfect picture as the gilt framed screen was lifted to emulate the theatre's safety curtain. Royal Court fundraising gala event (Mesmer). Royal Court Gala 2011 (The Royal Court Theatre sur Facebook) [merci à Regarding Rupert Penry-Jones]. Matthew Macfadyen discutant avec Rupert Penry-Jones ? Et voilà ! Merci à Helen Murray. Matthieu a écrit: Matthew Macfadyen discutant avec Rupert Penry-Jones ? The hair doesn't look like Matthew's? Or maybe that's just due to the quality of the pic. 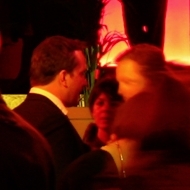 Out of focus [Damian Lewis] does look a little like RPJ. But I'm sure it's Damian Lewis because that's Helen McCrory with them. Time Out parties with Royal Court: photos (ish) from the event (Time Out London, 17 mai 2011). When we told you that party pictures would appear on this blog from the Royal Court Gala sponsored by Oakley Capital in association with Time Out, we meant it. Due to technical issues, however, we regret to say that we are unable to bring you more than these two stunning snapshots. The above shows guests eating at tables at Shoreditch Town Hall; the below shows RC alumni performing a short play by Richard Bean on those tables. If you squint, you may see Matthew Macfadyen, Romola Garai and Rachel Stirling (though you may not). We apologise that this is all we can offer you; we know it’s a poor effort.